Why Organize a Union with Your Fellow Workers? It is only through collective action that we can come together to win our demands on the job and recognize within ourselves that we have the power to change the world around us for the better. Maybe you felt upset about it but you didn’t know what you could do about it. You might have felt that you didn’t have any power to change the situation. Well you do! When workers act together to better their working conditions that’s a union! And the answer to the question – “But what can we do about it?” — is collective action! We are not here to lie to you. It is not easy, as you might have already guessed. It takes time and effort to talk with your fellow workers and organize with them to take action on the job and start to make things better. To start to realize the power that workers have on the job. Then there is the push back and resistance that will inevitably come from the bosses. They will lie to you and do everything they can to intimidate you and your fellow workers into backing down and staying in your place. This is why you have to talk with your fellow workers and learn about the ways that the boss will try to intimidate you. 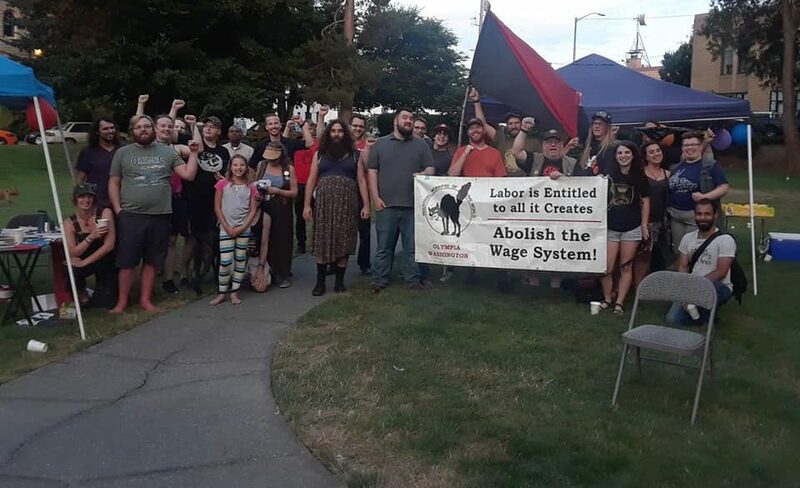 The Olympia branch of the Industrial Workers of the World (I.W.W.) is here to help you organize. Ultimately it is up to the workers on the job to organize their shop. But the I.W.W. can help you learn the tactics and skills to have your dignity on the job! We are here to help! If you have any questions or want to set up a meeting then get in touch. And remember, Solidarity – it’s a weapon, not a word! ← It’s Our One Year Anniversary!